FRCC is partnering with the Federal Deposit Insurance Corporation (FDIC) and its Money Smart program to empower youth in the St. Louis region with finaicial literacty. 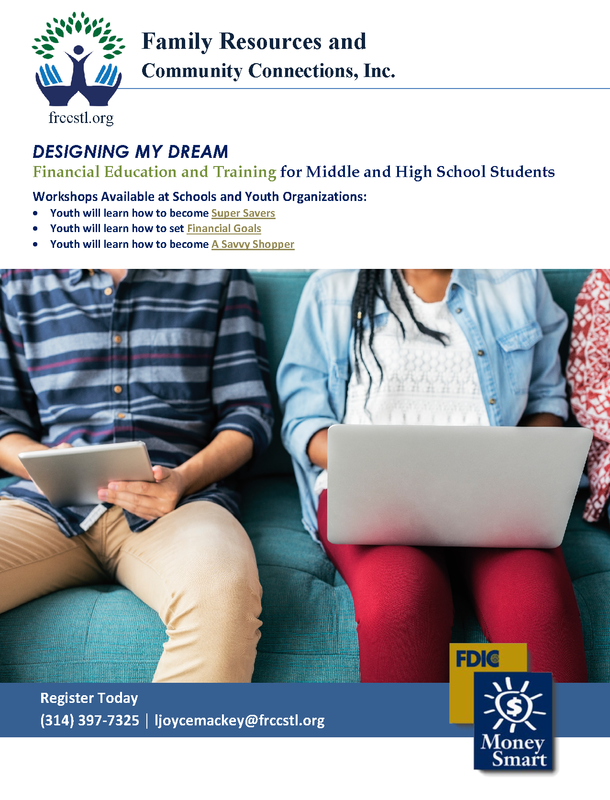 Designing My Dream Workshops are available at for schools and youth organizations. Youth will learn how to become Super Savers, how to set Financial Goals, and how to become A Savvy Shopper. About- Money Smart is a comprehensive financial education curriculum designed to help low- and moderate-income individuals outside the financial mainstream enhance their financial skills and create positive banking relationships. Money Smart has reached over 3 million consumers since 2001. Research shows that the curriculum can positively influence how consumers manage their finances, and these changes are sustainable in the months after the training. The Money Smart program may be used by financial institutions and other organizations interested in sponsoring financial education workshops. Collaboration is important to the success of any education effort. The FDIC encourages banks to work with others in their communities to deliver financial education and appropriate financial services, including to individuals who may not have a relationship with an insured depository institution.